Graduates of girls' schools are significantly more likely than their peers at coed schools to demonstrate stronger academic skills and greater academic engagement, and to see themselves as future scientists, important new research reveals. Girls' school graduates are also more likely to be deeply involved with their community and to exhibit higher levels of cultural competency and political engagement, reports the Higher Education Research Institute at the University of California, Los Angeles (UCLA). The findings of this peer-reviewed study build on previous research documenting the clear advantage girls' schools deliver to their students. Girls' school graduates are more engaged academically and socially than their coeducated peers, the combined body of research shows. They also are more likely to pursue graduate school, to aspire to a career in engineering, and to develop strong writing and public speaking skills than are girls who attended coed schools. "We see the benefits reported in this research come to life in our students and alumnae as they make their way through NCS and college and forge independent lives," said NCS Head of School Kathleen O'Neill Jamieson. "Their desire to contribute to their schools and communities—and this world—is profound; and they are keenly prepared to offer moral leadership, productive solutions, and creative energy to others." This research, led by Dr. Tiffani Riggers-Piehl, assistant professor at the University of Missouri-Kansas City, drew on data collected by the Higher Education Research Institute's Freshman Survey, the largest and longest-running study of higher education in the United States. The survey asks questions of students preparing to enter their first year of university. Dr. Riggers-Piehl and her team looked at the responses of nearly 6,000 female high school graduates, of whom about 15 percent attended independent all-girls schools. They used multilevel analyses to separate the effect of an all-girls education from other influences, including socioeconomic differences, race/ethnicity, parent education, and the characteristics of the high schools attended. The data reveal a consistent portrait of girls' school graduates who are more engaged academically and socially than their coeducated peers. The "results demonstrate differences in areas of critical importance in the 21st century for women as they enter university and beyond, thus emphasizing the contribution of all-girls schooling for women's success," the researchers said. Their report, "Fostering Academic and Social Engagement: An Investigation into the Effects of All-Girls Education in the Transition to University," was commissioned by the National Coalition for Girls' Schools. It follows the model of a 2009 HERI study led by Dr. Linda J. Sax and colleagues (including Dr. Riggers-Piehl). 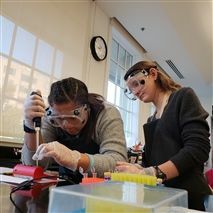 Olivia Harley '19, left, and Phoebe Ford '19 conduct biology lab work. Girls' schools graduates are more likely than their coed peers to see themselves as future scientists. Girls' school graduates are more likely than their peers from coed schools to study frequently with other students, research finds. From left, Goldie Roth '17, Elizabeth Thoren '17, and Natalie Kalitsi '18 discuss college engineering classes with Anna Nielsen '20 and other NCS students. Girls' school graduates are three times more likely than their coed peers to consider a career in engineering. Sam Douki '19 with art teacher Jennifer Dorsey. Girls' school alumnae meet more often with their teachers than do women from coed independent schools.